The Casio PX35 Review - Is this review worth a look? Let’s talk about pianos, baby, let’s talk about Casio PX350. Let’s talk about all the good things and the bad things (that this piano has to offer). First off, the Casio PX350 is going to help you produce music that’s much better than my rendition of Salt-N-Pepper. What else can it do? The long story short is that it is a power 88-key digital stage piano. 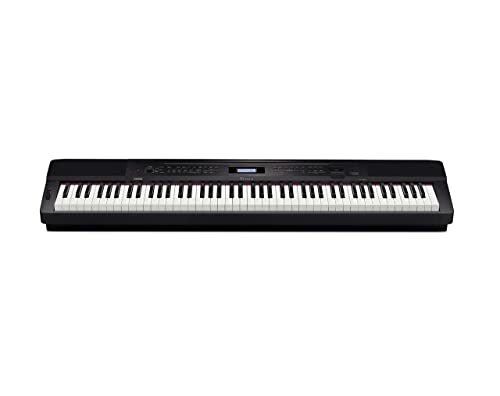 It has 250 instrument tones built-in, a tri-sensor scaled hammer action keyboard, 17 track recorder, award winning sound, all with class-compliant USB MIDI connection. Those are the specs, but we want to talk about what the Casio PX350 is actually capable of. Its smooth sound allows for an even better grand piano experience in the lightweight, small package that Privia is known for. What we love about the Casio PX350 is that when you sit down at this digital piano and you select one of the piano voices, stretch out your fingers and get to playing, it feels good. Casio has products that vary from feeling toyish to truly professional, and this one falls well within the range of professional (if you want to check out some other Casio products that we love, you can also see our reviews of the Casio WK-6600 and the Casio Privia PX-870). The playability is one of the things that sets it apart. When we say it feels good, we mean the hammer action makes it feel something like a stiff grand piano, firm and strong, which is surprising given the weight. The hammer action in combination with particularly the concert grand voice gives an authentic feel. To top it all off, the Casio PX350 is easy to bring along, so that great sound and feel can come with you anywhere. The whole electric piano is just 26 pounds and very sleek. To get a fuller picture of the best and the worst of this piano, next we’ll talk about the pros and the cons. First, we provide a short list, and then we’ll take you into a few more details about them. It also includes 250 built-in instrument tones, including strings, organs, electric pianos, brass, drums, bass and more. You can even combine them with the option for splits and layers for performances. It also includes 180 drum patterns and a 17-track recorder, so it’s unlikely you’ll get bored quickly. The voice options are many and the vast majority are quite good, although there certainly are a few that we could do without. That said, if you can latch onto a few, pairing them with the drum beats, you’re ready to be mixing. 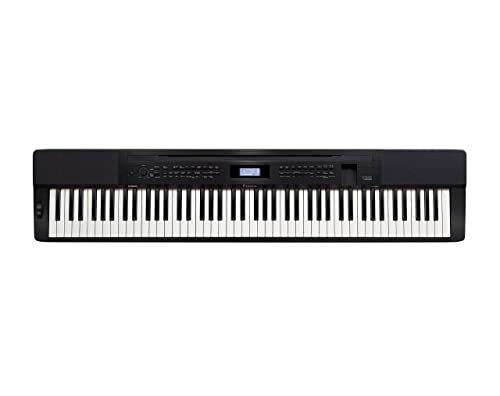 Although it’s quite standard in a similar mid-range electric keyboard, it’s worth mentioning that the Casio PX350 has the capability for a USB MIDI connection. The MIDI connection is “class compliant,” which means that it’s ready to be used with Windows or Mac computers. It’s also compatible with Apple iPads with Apple’s Camera Connection Kit. 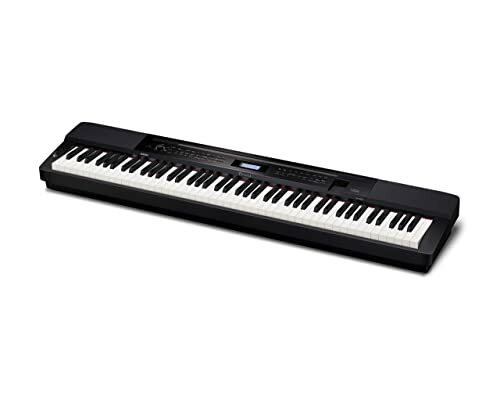 MIDI connection is essential for digital keyboard users, and Casio’s got you covered with the PX350. We also want to remind you that (like always) Casio’s also made the controls super easy to navigate. That’s something we consistently find helpful from Casio’s pianos and the Casio PX350 doesn’t miss a beat in its usability. The final pro that we want to highlight are the speakers. Although the built-in speakers aren’t quite performance quality, they’re pretty good and we found them to be more than good enough for at-home use. As much as we rave about the Casio PX350, there are some downsides. We’ll walk you through them so you know what you’re getting yourself into. First off, as excellently weighted as the keys are (we love the hammer action), they can get a little noisy, especially when you have the volume on one of the quietest modes. If you like to play quietly, the clunky noise is going to bother you, so beware. We also want to note that as great as the display is for navigating the different options and controls it can get really hard. Less-than-ideal lighting situations are not the Casio PX350’s friend. Playing in the dark or with significant glare from the sun might make it really hard to change the settings on your Casio PX350. There are three classes of voices that most performance pianists want from a digital piano – grand piano, electric piano and organ. Casio rocks the grand and the electric voices, they’re certainly one of the strong points of the Casio PX350. That said, We find the organ voice extremely lacking. If that’s one of your go-to voices, look out because we couldn’t find one that we loved. In general, the Casio PX350 is sleek and we love the smooth black color. For those that highly value aesthetics, though, when you take an even closer look at the keys, you actually notice a black or white paint wood finish, not matte. Although it doesn’t affect the actual feeling of the keys, it’s a small aesthetic detail that might bother some. At the end of the day, we love the Casio PX350. It’s portable, it’s playable and it’s pocket-friendly for a mid-range digital piano. It’s impossible to escape some minor flaws but for the range of piano that the Casio PX350 falls into, it’s among the top of its class. We can’t recommend the Casio PX350 enough if you’re in the market for a pleasant mid-range digital keyboard with a solid feel, excellent voice range and the ability to take it just about anywhere with you.